A large, lovingly restored masseria with pool within easy reach of the beaches of southwest Puglia. With its intriguing mix of original features, modern comforts, rustic charm and luxurious touches, Masseria Scippi offers pleasant surprises at every turn. It combines privacy, peace, voluminous space inside and out, and lots of options for reclining, dining and unwinding, including a couple of roof terraces overlooking the surrounding countryside. All in all, a perfect home from home for large groups of family or friends. Inside: Masseria Scippi has received a loving, high quality restoration and is a fascinating home to explore, thanks to the wealth of original features that echo the property’s history, and the unique blend of contemporary and rustic styles throughout. Accommodation at Masseria Scippi is spread over three buildings, which surround an internal lawned courtyard. The first, the oldest part of the property, is situated on the left of the courtyard. Here, on the ground floor, a small hallway leads into a fully-equipped kitchen decorated with fine maiolica tiles and an original stone fireplace. A few steps lead up from here to a snug living and TV room furnished with sink-in sofas and a breakfast table, and a guest bathroom. Doors from the kitchen and living area lead outside to a sitting area and the main al fresco dining area. At the base of the courtyard is the bedroom wing, comprising five bedrooms. Each one has its own independent access from the courtyard. Four of the them have an en-suite shower room and both a double and a single bed, making for flexible sleeping arrangements. The spacious fifth bedroom, a master suite, has a double bed, an en-suite bathroom with tub and shower attachment, a kitchen and, on a mezzanine level, a living area. The third part of Masseria Scippi, which is located across the courtyard gardens from the first, contains the largest and most spacious indoor dining area and kitchen. The kitchen, which has a wood-burning pizza oven, is also the best placed for serving the al fresco dining area. Outside: the main gate at Masseria Scippi opens onto a wide path running along base of the courtyard in front of the bedroom wing. From here a few easy, shallow steps lead on either side of the lawned quad to the gorgeous shady al fresco dining area, where you will probably take most of your meals, and which is served by two kitchens, the one in the main house and the one in the annex opposite. A few more steps from here take you up to the inviting pool, which is surrounded by paving, lawns and dry stone walls, and served by a bathroom and a couple of outdoor showers. Masseria Scippi also boasts a splendid panoramic roof terrace situated on top of the main sleeping block and accessed via a flight of external steps to one side. Shaded, furnished and offering calming views, this is the perfect spot from which to watch the sun go down with an aperitif in hand. While four of the five bedrooms have both a double and a single bed, the maximum number of guests (including children) is always 10. Should you wish to use one of the single beds for an extra child sleeping in the same room as his/her parents, please contact us for more information and to confirm the supplement. Masseria Scippi is situated in the south of the Salento and surrounded by olive groves. The area is dotted with charming rural towns such as Taurisano, Ugento, Miggiano and Specchia, in each of which you will find local markets, restaurants, some lovely architecture and a sense of the simple life. The sandy beaches of the Ionian coast are a short drive away past Ugento, and you may choose between free beaches and some stylish lidos. The baroque jewel of Lecce is less than an hour's drive to the north, and is a great day out for anyone interested in Italian art and architecture of the 17th and 18th centuries. Further south, the "turn of the century" resort town of Leuca, right on the "heel" of Italy, with its Liberty villas is also well worth a visit. Meanwhile, a short drive to the northwest, will take you to the fortified island town of Gallipoli, with its lovely old centre, its sea-front fish restaurants and a gently bustling atmosphere. "Our holiday exceeded our expectations. The photos on your website don't do Masseria Scippi justice .. we were so pleasantly surprised." The quality and facilities of Masseria Scippi were splendid. We were delighted to have daily maid service. We were not expecting that. The quality and value for money of the in-house catering was magnificent. Our holiday exceeded our expectations. 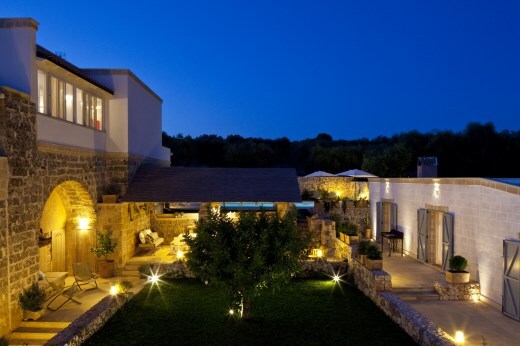 The photos on your website don't do Masseria Scippi justice .. we were so pleasantly surprised. The caretakers were fantastic, nothing was too much trouble. Our stay at Masseria Scippi was really just perfect. Thank you. The staff were unbelievable and the breakfast table and the figs were perfect to have every morning - we were very spoilt. Masseria Scippi is stunning and offers a lot of space, including around a beautiful swimming pool. The property offers a lot of shaded areas to retreat from the sun. It was fabulous having the property caretakers come in every day. They were so kind and generous and spoilt us with baked goods and fruit and vegetables from the garden. The team at Masseria Scippi were truly wonderful....they really looked after us so beautifully; nothing was too much trouble and so kind and thoughtful. I'd happily follow The Thinking Traveller all over the world, so long as you could keep up your wonderfully personal service.....that's really what makes you so special. Booking a holiday with you is so blissfully easy. Masseria Scippi was beyond our expectations. It is a phenomenal property, everything was perfect and we wouldn't change a thing. Tout était parfait et l'équipe sur place absolument charmante et efficace.